Turn the ring 2 until the symbol is opposite mark 3. An indicator light on the instrument panel will come on. Depending on the vehicle, the daytime running lights come on automatically when the engine is started. The daytime running lights function is activated by default. Depending on the vehicle, it can be deactivated. Please refer to the multimedia touchscreen system instructions. Turn the ring 2 until the symbol is opposite mark 3. This indicator light on the instrument panel comes on. 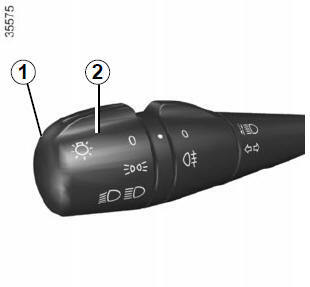 Turn ring 2 until the AUTO symbol is opposite mark 3: with the engine running, the dipped beam headlights switch on or off automatically depending on the brightness of the light outside, without any action on stalk 1. If driving on the left in a left-hand drive vehicle (or vice versa), drivers must have the lights adjusted (except for vehicles fitted with xenon bulbs) by an authorised dealer for the duration of the trip. With the engine running and the dipped beam headlights lit, push stalk 1. This indicator light on the instrument panel comes on. 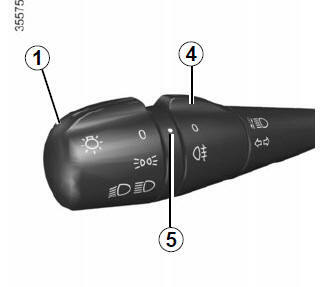 To return to the dipped headlight position, pull stalk 1 towards you again. automatically, if the ring 2 is in AUTO position and if the main beam headlights are not switched on. The lights go out automatically when the engine is switched off, when the driver’s door is opened or the vehicle is locked. In this case, the next time the engine is started, the lights will be switched back on according to the position of the ring 2, taking into account the exterior light level, without moving the stalk 1. NB: if the fog lights are lit, the lights are not switched off automatically. If the lights are switched on after the engine is switched off, a warning beep sounds when the driver’s door is opened to warn you that the lights are still on. Turn centre ring 4 on the stalk 1 until the symbol faces mark 5, then release it. 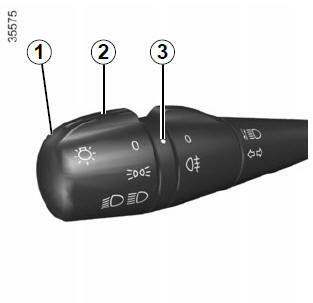 Operation of the fog lights depends on the exterior lighting position selected, and an indicator light will light up on the instrument panel. Turn centre ring 4 on the stalk until the symbol faces mark 5, then release it. Operation of the fog lights depends on the exterior lighting selected, and an indicator light will light up on the instrument panel. When driving in fog or snow, or when transporting objects which are higher than the roof, the headlights do not come on automatically. Switching on the fog lights remains the responsibility of the driver: the indicator lights on the instrument panel inform you whether the fog lights are lit (indicator light on) or not (indicator light not on). Turn ring 4 again until mark 5 is opposite the symbol for the fog light you wish to switch off. The corresponding indicator light goes out on the instrument panel. The front and rear fog lights switch off when the exterior lights are switched off.